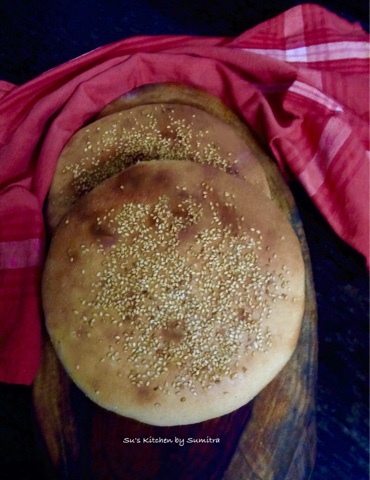 It's a flat bread and made in every household and is had with soups, vegetables and gravy dishes. 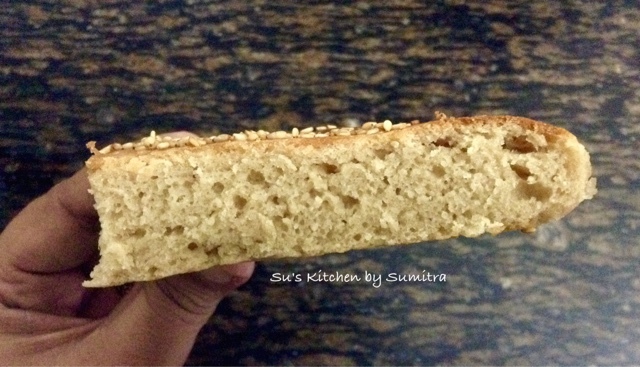 It can be made with All Purpose Flour or Whole Wheat Flour and Semolina. Very easy to make and healthy too when made at home. Combine 1/2 cup warm water, yeast, honey in a cup. Let it stand till it rises. Take a mixing bowl. Add the flour, semolina and salt. Mix it together. Add yeast mixture, 2 tablespoons oil and 1/2 cup of lukewarm water. Mix it. If required add the rest of the water little at a time and form a soft dough. Turn the dough out on a flat surface. Apply oil in between kneading on the palms and knead the dough for 10 minutes or until smooth. Grease a baking tray. Divide dough into 2 equal portions. Knead for a minute. 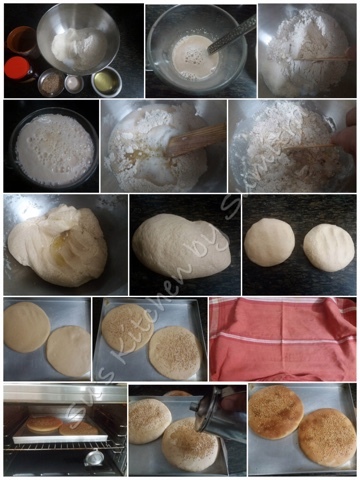 Roll each piece of dough into a round thick disc. Place it on the tray. Sprinkle sesame seeds. Press it lightly. Cover the tray and let it stand 40 minutes. Preheat the oven to 200 degrees Celsius. Bake for 15 minutes. Take the tray out of the oven and drizzle rest of the remaining oil on top of the breads. Put the tray back in the oven and back for another 10 minutes or until golden brown on top. Take it out of the oven and serve warm.